thou dost pray to thy Son Christ our God and savest all who seek thy protection. and who pray with compunction, contrition, and tears and with unflagging hope in thee. for thou art a divine protection to thy servants. to the speedy helper, the warm salvation, to the Virgin's protection. Let us speed to prayer and hasten to repentance. for her patient and God-fearing servants. This Christmas season, let us honor Our Lord by venerating His Most Pure Mother, Our Lady of Kazan, Protectress of the Southland, Our Hope for Deliverance. “Wonderful is the Providence of God,” writes Protopriest Lev Lebedev, “in bringing him to the summit of ecclesiastical power at this terrible Time of Troubles… In 1579 he had been ordained to the priesthood in the St. Nicholas Gostinodvordsky church in Kazan. And in the same year a great miracle had taken place, the discovery of the Kazan icon of the Most Holy Theotokos. This was linked with a great fall in the faith of Christ in the new land, the mocking of the Orthodox by the Muslims for failures in harvest, fires and other woes. A certain girl, the daughter of a rifleman, through a vision in sleep discovered on the place of their burned-down house an icon of the Mother of God. Nobody knew when or by whom it had been placed in the ground. The icon began to work wonders and manifest many signs of special grace. The whole of Kazan ran to it as to a source of salvation and intercession from woes. The priest Hermogen was a witness of all this. He immediately wrote down everything that had taken place in connection with the wonderworking icon and with great fervour composed a narrative about it. The glory of the Kazan icon quickly spread through Russia, many copies were made from it, and some of these also became wonderworking. 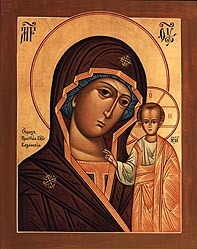 The Theotokos was called “the fervent defender of the Christian race” in this icon of Kazan. It was precisely this icon and Hermogen who had come to love it that the Lord decreed should deliver Moscow and Russia from the chaos of the Time of Troubles and the hands of the enemies. . . .
“On the advice of Patriarch Hermogen, the holy Kazan icon of the Mother of God was taken into the levy of Minin and Pozharsky. “In the autumn of 1612 the second levy was already near Moscow. But it did not succeed in striking through to the capital. Their strength was ebbing away. Then the levies laid upon themselves a strict three-day fast and began earnestly to pray to the Heavenly Queen before her Kazan icon. At this time Bishop Arsenius, a Greek by birth, who was living in a monastery in the Kremlin, and who had come to us in 1588 with Patriarch Jeremiah, after fervent prayer saw in a subtle sleep St. Sergius. The abbot of the Russian Land told Arsenius that ‘by the prayers of the Theotokos judgement on our Fatherland has been turned to mercy, and that tomorrow Moscow will be in the hands of the levy and Russia will be saved!’ News of this vision of Arsenius was immediately passed to the army of Pozharsky, which enormously encouraged them. They advanced to a decisive attack and on October 22, 1612 took control of a part of Moscow and Chinatown. Street fighting in which the inhabitants took part began. In the fire and smoke it was difficult to distinguish friend from foe. On October 27 the smoke began to disperse. The Poles surrendered…. Edmund Burke taught us that few rights are absolute: That is, a community's particular circumstances will determine the extent to which a right may be virtuously exercised. To that end, if a town, county, parish, or state determines that it is in their best interest to ban or restrict this or that gun, sale of this or that ammunition, etc., we must let them go their way, however much we may disagree with their decision. What must not occur is a command from on high directed to every town and village and state to ban this or that - or else. A couple hundred men and women in D.C. oughtn't try to settle the issue for more than 300,000,000 others who all live under quite different conditions. No, let each locality decide for itself; that is the only wise and moral way of handling a question of this magnitude in a country of this size. Radio France International stated in their broadcast on Saturday morning (15 Dec. 2012) that the five worst school shootings have all taken place within the States of this unfortunate Union. Remembering John Remington Graham’s simple but powerful truth from his book Blood Money - when something in history appears which would not be expected to exist, that thing has appeared because of the plans men purposefully put into action - we must ask why this particular pattern of violence has emerged in the schools of the united States and not elsewhere. The answer in short: These murders and others like them are likely the latest method employed by the international moneyed elite in their attempt to subjugate the people of these States to their will. A bit of explanation is perhaps in order. The first stage of this takeover was fomenting the awful kin-slaying falsely called a civil war (the South was not trying to conquer Washington, D.C., but instead trying to rid herself of its growing mischief). In the fires of that tragedy many noble men and institutions were lost on both sides, allowing the elite to begin their consolidation of political power in Washington and their financial power in New York City. They strengthened their grip on the country by less violent, though no less significant, means in the coming years: the 14th, 16, and 17th Amendments to the u.S. Constitution which tore down some of the great bulwarks that had protected local self-determination for so many years; the Federal Reserve Act, which granted the elites nearly complete control of the (now unwillingly united) nation’s economy; and widespread, unchecked industrialisation and mechanisation made more and more formerly independent, self-sufficient farmers, craftsmen, and labourers together with their families into wage-slaves of the elite who owned the factories, the railroads, etc. Other steps such as the ruin of true education and the use of film, TV, etc. to stupefy and indoctrinate the general public will have to go unmentioned for the present. Our immediate concern is that the elite are now entering the final stages of their enslavement policy toward the united States. They desire us to be as the docile, groveling beggars of Western Europe who blindly worship the Provider State controlled by this same elite from behind the scenes, whose wealth is taken from them by the state and transferred to the elite. But that is unlikely to happen here so long as the greater part of the folk is armed (and suspicious of government power). The elite’s answer to this dilemma? Bring about (whether directly or indirectly involved) shootings at public locations (schools, the theatre in Aurora, Colorado, and so on), demonise the guns, place heavy restrictions on their use, and in the end, outlaw and confiscate as many of them as possible. It sounds outlandish and outrageous, like the ranting of a fool. But we must remember who we are dealing with. These elites are the of the same ideology and families as those who started a war among our forefathers that killed several hundred thousand men on our own soil; who funded the Nazis in Germany and the Soviets in Russia; and who today are sowing wars in Africa and the Middle East so they can better exploit the people and resources of those lands for their enrichment (among other wicked acts). These are not nice but misguided men and women. That is a title best hung on the elite’s puppets in Washington and in our own state capitals, otherwise called Democrat and Republican governors, senators, etc. These elites are in fact very evil people, and we must expect them to do very evil things to achieve their ends. The English peoples the world over have an active, vivid imagination and react emotionally to it (Hillaire Belloc, ‘The Conversion of England’, Essays of a Catholic, TAN Books and Publishers, Rockford, Il. : 1992, p. 62). Thus, the elite give our imagination the most potent images they can conjure - innocent children, little, small, defenseless, slaughtered by men with guns - in the hope that we in our usual overly emotional response will recoil in horror and tamely accept the outlaw of these weapons that hinder their plans for us and for our fatherland. This would leave firearms mostly in the hands of either government agents or criminals, neither of whom are trustworthy. We shouldn’t overlook the very real suffering of those in Newtown. The living and the departed need our prayers and whatever other help we can offer, now more than ever. Nevertheless, the elite’s goal of our total subjugation is yet unrealised. We must therefore expect more troubles of one form or another to come. And when they do, let us not be found unprepared. Cellphone addiction shows similarities to compulsive buying and credit card misuse, a study by marketing researchers at Baylor University in Texas found. Previous studies have shown young adults send an average of 109.5 text messages a day or approximately 3,200 texts each month. They receive an additional 113 text messages and check their cells 60 times in a typical day. "At first glance, one might have the tendency to dismiss such aberrant cellphone use as merely youthful nonsense -- a passing fad. But an emerging body of literature has given increasing credence to cellphone addiction and similar behavioral addictions," Roberts said in a Baylor release Wednesday. As for technical applications, if Greek science didn't produce many, it isn't because it was incapable of doing so, but because the Greek savants didn't wish it. These men, obviously very much less advanced than we are, as is natural seeing that they lived twenty-five centuries ago, feared the effects of technical inventions which could be made use of by tyrants and conquerors. So, instead of delivering to the public the greatest possible number of technical discoveries and selling them to the highest bidder, they kept rigorously secret all the ones they happened to make for their own amusement; and, apparently, themselves remained poor. If today's scientists won't put their harmful mindcrafts away for the good of the wider public, we need to do it ourselves, following the excellent example of the Amish and other wise folk. For the sake of joy and beauty in dark times. Dr Richard Land, a leader in the Southern Baptist Convention, recently praised the work of the Council on Foreign Relations (CFR) for its immigration policy during a roundtable discussion of the topic aired on C-SPAN. The CFR being one of the foremost organisations promoting one world government, this was cause for alarm. After a bit of digging, it was found that he is indeed a member of the CFR and that his own stance on immigration echoes that of 'open borders' advocates like Sen John McCain and former Pres George W. Bush. Are there other ties between the CFR and the Southern Baptist Convention? Further study is surely called for. All Southern Baptists of good will, take note and be alert. The South, as we have said here before, is a child of Wessex. It is therefore very meet to highly exalt the man who carried the Christian Faith to our ancestors, and thus to us as well in an indirect manner. 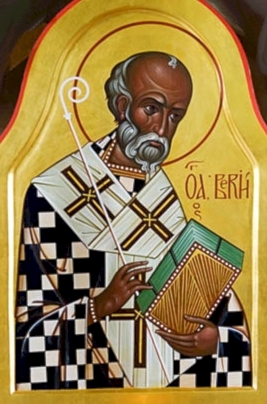 That man is our holy father, St Birinus, Bishop of Dorchester-on-Thames, whose feast is celebrated today (3 December). He it was who converted and baptised King Cynegils of Wessex and many of his subjects in 635 A.D., laying a solid foundation for that kingdom for years to come (which was nevertheless broken quite badly by the corruptions of the Norman conquerors in the 11th century). A brief account of the life of St Birinus is available on pages 64 and 65 of this book by Vladimir Moss. to grant our souls forgiveness of sins. Governors of Southern States are failing us miserably. Instead of ensuring that each willing family has the means to support itself (either through the ownership of productive land or the ability to produce a craft - a truly self-sufficient society), these governors and their docile state congresses are driving us further into wage slavery by welcoming national and international retailers and factories to the South (using subsidies, which is to say, bribes), which destroy authentic community life wherever they locate. I want to focus on Gov Jindal of Louisiana briefly (though it may be instructive to investigate other Southern governors in the future). His prominent position in the national Republican Party should be enough to make one doubt his trustworthiness, his loyalty to the South and her ideals. But beyond that is his dedication to luring said large, impersonal, degrading (to people and land) corporations to Louisiana, mainly through distribution of money from the Mega-Project Development Fund (and other similar hoards of cash), at the expense of existing small local shops, craftsmen, and farmers. Louisiana has long fostered a business climate that appeals to foreign direct investment. Since 2006, the injection of new investment from international firms has almost doubled, skyrocketing Louisiana’s overall cumulative FDI to more than $40 billion in 2011, a figure that dwarfs historic levels seen in most of the South. Such 'investment' only makes us weaker in the end, however, as we rely on outsiders to 'give us a job' rather than rely on the normal interaction between the local soil, weather, ore, plants, etc. and the character of the people living among them to form a stable economic structure that can thrive from generation to generation. Not to be forgotten are the corrosive effects on local culture that such a large-scale importing of foreign influences causes. Perhaps most troubling, however, is his signing of a bill (SB 312/Act 761) to force the fluoridation of drinking water for public water systems with at least 5,000 service connections. This form of fluoride, sodium fluoride, is extremely harmful, but this information was not discussed during debate on the bill. SB 312 was also pushed by the Louisiana Dental Association, which gave Gov Jindal $15,000 in campaign donations not long after the bill was signed into law. Water fluoridation has long been a tool of the modern eugenics movement (good timeline here, but ignore the spiritual theories), which sadly wasn't solely a Nazi programme, but has a presence in the united States as well. Does Gov Jindal's support for SB 312 mean that he is of one mind with the social engineers? We cannot say for certain. But by supporting SB 312 in spite of the overwhelming evidence that fluoride does much more harm than good, he must be viewed skeptically. Given the dearth of virtuous leaders in the South and throughout all the States, many in their desperation will no doubt be attracted to Gov Jindal because of his rhetoric. But he is no friend of traditionalists and ought to be opposed when he finally takes his leave from Louisiana for the higher office he longs for. With secession fever spreading, now is a good time to act to reorder the Union, especially since the federal government 'has gone rogue' and 'has been hijacked by foreign special interests - mainly banking cartels' (quotes pulled from this story). While the plan laid out at that site is by no means perfect (the Union has gotten much too large for the federal government to act justly toward the various regions and cultures composing it), it seems to be the best shot at re-establishing limited and decentralised government at this moment. I encourage everyone to keep track of this effort to fight Washington, D.C., at the State level being led by Alex Jones and his team, and to be ready to lend a hand if or when the time comes. Now that the chaos of the election season is over, what can we do, politically speaking, to blunt the agenda of the statists/globalists? 1. Nullify as often as we can - even at the county/parish or city level. 2. Follow the advice of John Remington Graham in his book Blood Money: The Civil War and the Federal Reserve - Use the U.S. Constitution's method of adoption against it. Which is to say, gather the states, counties, parishes, cities, and towns that wish to form a new confederation, write an instrument of union (modifying the defects of the current constitution), and state that this proposed union will go into effect when thus-and-such number of states, etc. shall have adopted it. This is precisely the method used by the framers of the 1787 constitution to supersede the Articles of Confederation, even though the latter document required unanimous consent from all the states before it could be amended. See Article VII of the 1787 constitution. 3. Strengthen your local community. 4. Start a movement to downsize your single large state into several smaller states. Would You Vote 'Putin' for U.S. President? Every single time the US chattering class gets sanctimonious toward Russia, I find myself sympathizing overwhelmingly with the Russians. This says less about any naive delusions of mine regarding Russia’s leadership than it does about my loathing and contempt for so-called “American values”: The radical Democratic wing of liberalism takes the breaking up of my people’s religious tradition and historical memory as an end unto itself, while the Republican wing of liberalism sees in such “creative-destruction” a necessary means of promoting finance capitalism. For someone who wants an actual home for himself and his family there’s no meaningful choice whatsoever to be found in the American system. Of course I’m not claiming Russia’s rulers actually do their duty, much less that they do it well; I am saying that however unscrupulous, Machiavellian, and power-hungry they may be, they are at least vaguely aware of what their duty is: To preserve the nation. This stands in stark contrast to Western rulers, who feel it their duty to destroy their respective nations so as to make way for a Brave New World. Alex Jones and his team explode the myth in a new video. Language expresses something of the inner spirit of a nation, something of its very essence. The South is mainly of Anglo-Saxon origin, and if we would recover again the noble spirit of our ancestors (expelling the Puritan-Yankee spirit that indwells us now), it would behoove us to learn as much of the Old English language of our forefathers as we can. A good place to start is Dr Mark Atherton's guide. Or have a listen to the model prayer of Our Lord. You may read along as you listen if you'd like. 1. The voters don't control the country. The People Who Run Things do. 2. Modern science has some occult roots. 3. Weather modification as a weapon is a real threat. Politics flows from theology; the two are inseparable. Try as they might, those who want a religiously neutral politics will not succeed in the end. Gary North shows why in a short essay. I do not advocate getting rid of all technology/machines, but those who are less reliant on them do seem to have more joy in their lives, as illustrated in the poem below about tending sheep by Rev William Barnes. This is more than likely because machines direct our attention no higher than the men who make them and the matter they are made of, while care of animals or farming of any kind tends to direct our attention toward the Creator Who has made and sustains all the living things that are in the world - and Who is also the source of true happiness. Here I do rove below the lark. Do zee em all a−penn'd an' twold. An' pullèn o' their milky bags. Wi' silent flight along the groun'. To do what he's a−zent upon. An' meäke em ready vor the sheärs. Do mark their zides wi' meästers mark. Wi' merry sounds do sheäke an' ring. Could the Banking Crisis Mean an Independent South? The richest, industrial province of Catalonia is planning to hold a referendum on secession because the central government is taxing them severely to help faster sinking provinces, pushing Catalonia into ever deeper debts it cannot pay. Roughly 75% of the people in Catalonia tell pollsters they want a referendum on secession. Just yesterday the federal government moved to take more direct control over Catalan education to Hispanicize the people more, which was already a major reason the people want to go free. The societies that have already been decentralizing and disintegrating faster and faster, such as the .K [sic], will very likely disintegrate into their more tightly, culturally knit local, provincial societies, especially along the ancient lines of earlier nations. The Irish are already free, Wales and Scotland have been growing in power with "devolution" of power from the UK, and now Scotland is becoming more nationalistic. I expect Italy will likely break up in part, at least losing the Northern League nations. These would indeed be healthy developments, as nations can become too big (like an overweight man, for instance), and one hopes that something good would come of the currency inflation, real estate crash, and other disorders that have resulted from the scheming of the megabanks. Knowing this, and also remembering that the saints of a particular place pray and act on behalf not only of those who live in that particular place but also of those who have left it for another land, and a spectacular light dawns in the mind, a wonderful and warm and luminous light. For now we Southrons realise that we have in Heaven a great intercessor before the Lord God, even this: a patron saint of our Southern nation, the best of English kings, King Alfred the Great - defender of his Christian homeland against pagan invaders; not despairing completely in defeat and humble and generous in victory; enlightener of his people; a lover of beauty in word and craft; begetter of saints; a strong tower for the weak of the realm; great in wisdom; mighty in asceticism. There is certainly a strong Celtic and African presence in the South, and in some places French and Spanish also. The saints of these places must be venerated and entreated often as well: St Michael the Archangel, St Genevieve, St Moses the Black, St Columba, Sts Brigid, Cybi, Ninian, and others besides, together with the saints of North America - those who are physically nearest to us. Saint John Maximovitch, Wonderworker of Shanghai and San Francisco, one of these North American saints, taught us to do this by his own holy example: ‘Now that he [St John Maximovitch - W.G.] was an apostle, he called upon each local saint he learned about, each new brother or sister in the Body of Christ, to provide heavenly help in evangelizing new lands’ (Hieromonk Damascene, Father Seraphim Rose: His Life and Works, 3rd ed., Platina, Ca., St. Herman of Alaska Brotherhood: 2010, p. 316). As has been mentioned in an earlier post, the South has produced no saints of her own that we know of, so the saints of Africa, Wales, etc. - who laboured among our ancestors - are our local saints for now. As we await the first blossoming of Southern saints, then, let us rejoice in the happy revelation of our close kinship with Wessex, and pray continually to our highly exalted patron saint, King Alfred - devoted intercessor and heavenly protector of the Southland - for our deliverance from all oppression and for all that is good and proper for our souls and bodies. If you think either President Obama or Governor Romney have the best interests of the 'little guy' at heart, a quick look at their top contributors will quickly dispel that notion. It is time we replaced the two-party oligarchy with a better system.